Son of the Naboo noble Cosinga, Palpatine grew up to be cruel and filled with rage. His opposition of his father gained him the attention of Darth Plagueis. He contacted him and Became his apprentice. He learned many secrets from Darth Plagueis in the Dark Side of the Force. They were often experimenting with the Dark Side, and one of their experiments lead to the Force to be tilted out of balance. In response, the Force created Anakin Skywalker, also known as the Chosen One. Upon receiving the power and ability to do so, Palpatine killed his master Plagueis, following the Rule of Two Sith tradition that the apprentice surpasses the master. Last updated by TheCoolness on February 4, 2018. 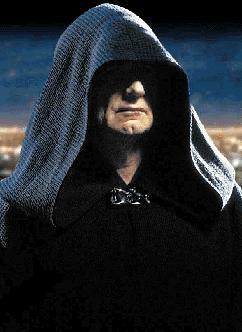 Contribute Profile Information for Darth Sidious.